Hubbard Glacier, which is found in Disenchantment Bay at the end of Yakutat Bay, is one of more than 110,000 glaciers in Alaska and North America's largest tidewater glacier. Hubbard Glacier was named in 1890 for Gardiner G. Hubbard, who was the founder of the National Geographic Society. As cruise ships enter Yakutat Bay, Hubbard Glacier can be seen from more than 30 miles away. This massive Alaska glacier is a staggering 76 miles long, 6.5 miles wide, and 1,200 feet deep. Its face is more than 400 feet high, which is as high as a 30–40 story building. The Malaspina Glacier is also found in Yakutat Bay. Malaspina is a piedmont glacier, does not reach into the bay, and is difficult to see from a ship, even though it is about the size of Switzerland!. 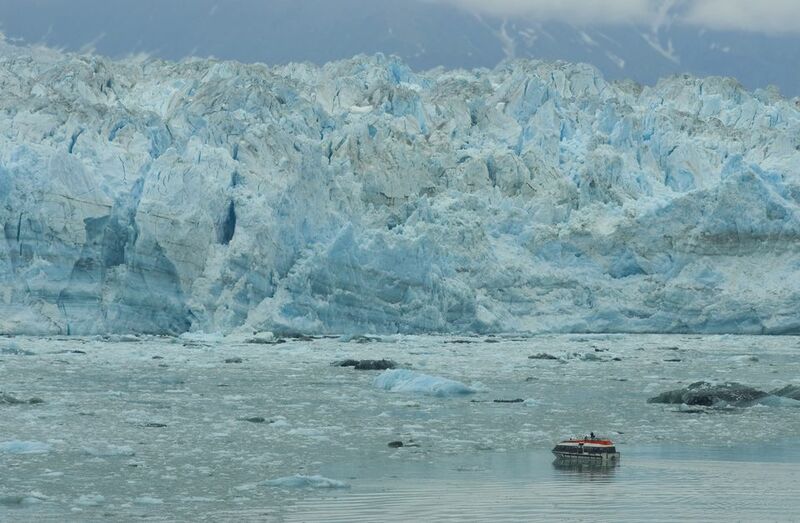 All Alaska cruise itineraries include at least one glacier. Alaska is home to more than 50 percent of the world's glaciers, ranging in size from a few feet to many miles in area. The "face" of a glacier often looks like it has been cut, leaving a straight edge at the terminus of the glacier. Hubbard Glacier is North America's largest tidewater glacier. Cruise ships sailing from Seward often stopover at Yakutat Bay on the Alaskan panhandle. Seals can be differentiated from sea lions because they do not have articulated flippers that bend like elbows for climbing and exposed ear folds. Steller sea lions are easily seen in Alaska because they are often lying on buoys. Since seals do not have articulated flippers, they cannot climb up on the buoys or piers. They can drag themselves onto flat surfaces like this small iceberg. What's It like to Cruise Alaska on a Small Ship?